Dear Hollywood aficionados, movie lovers and fans of healthy & good film entertainment. “The Omega Code“, released in October of 1999 had a Lifetime Gross Revenue of $12,614,346 and played in 450 theaters. This film was the star of Christian movies in the 90’s and pretty much the only movie with some success at the box office. Two years later “Left Behind” tried to be successful on the Big Screen with nearly double as many theaters (867) but it only brought in $4,224,065. Later that year in September of 2001 “Megiddo: The Omega Code II” played in only half of it’s predecessor bringing in $6,047,691 and it was released in only 353 theaters. Our prayer efforts really started in autumn of 2001. Several ministries had realized how important it was to pray for Hollywood and the entertainment industry. Hollywood was identified as a mission field. One ministry “Hollywood Prayer Network” even assigned intercessors to actors and producers and people working in the entertainment industry. 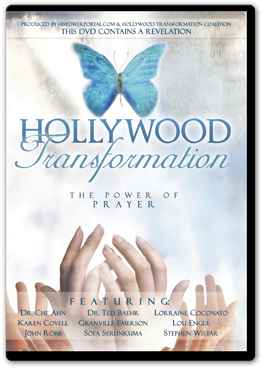 In January of 2002 I started to executive produce the documentary “Hollywood Transformation“, subtitle “The Power of Prayer”, where I interviewed over 30 people, asking them specifically what they thought was God’s plan for Hollywood. In October of 2002 “Jonah: A Veggie Tales Movie” played in an astounding $25,581,229 in 1,625 theaters. But this success did not really count, as it was an animation movie for kids, that in comparison with large Disney productions paled and still was very small in comparison to the big studio blockbusters. While Jonah added one million after another to their box office, I was invited to travel to South Africa to the International Prayer Council to present “Hollywood Transformation” to 300 participants from over 70 nations. After the presentation a commitment from over 30 different nations was achieved, where they committed to start praying FOR Hollywood instead of cursing Hollywood as they had use to do in the past. 2 years later in February of 2004 the world witnessed an amazing and miraculous spectacle: A film that was not even in English, but in a language that nobody spoke in the world, that was released in ancient Aramaic, made history and became the 3rd largest grossing film that year in the US playing in $370,782,930 in 3,408 theaters, it was Director Mel Gibson’s famous “The Passion of the Christ“, worldwide the movie played in over $611 Million. Hollywood was amazed, stunned and in shock. Studio executives scrambled to set up meetings and started to study this strange phenomenon and research about an uncharted market segment in the entertainment industry that obviously had been completely overlooked by all the market experts in the industry : The faith based movie market segment. Many of the majors started their own Faith based film divisions: Twentieth Century Fox is one of the major studios with a faith-based dept., FoxFaith. Affirm Films, a division of Sony Pictures Worldwide, Sherwood Pictures, Spiderwood Productions, Reverence Gospel Media LLC and Believe Pictures are other examples of productions companies that started to produce many inspirational films. 10 years of maturing, ripening and several higher up’s and some down’s followed. Highlights were certainly “The Chronicles of Narnia: The Lion, the Witch and the Wardrobe” raking in $291,710,957 in 3,853 theaters in December of 2005. “End of the Spear” cost $10 Million to produce and brought in about $12 Million. “Facing the Giants” in 2006 turned out to be a great success story of one dedicated church, producing an independent film with a mini budget of $100,000 that made over $10 Million at the box office, released in only 441 theaters. Their success- What an injection of faith into the arms of the independent faith based film producers! In October of 2006 “One Night with the King” with a production budget of $20 Million played in only $13,395,961 in 909 theaters, while 2 months later “The Nativity Story” brought in $37,629,831 on 3,083 screens with a production budget of $35 Million. 2008 brought us two great movies: “The Chronicles of Narnia: Prince Caspian” played in $141,621,490 in a wide release on 3,929 screens, worldwide $419 Million with a very high production budget of $225 Million. A much less riskier production called “Fireproof” from Director Alex Kendrick with a production budget of only $500,000 brought in an astounding $33 Million plus. 2010 brought us another wide release of Part 3 of “The Chronicles of Narnia:The Voyage of the Dawn Treader“. It had a production budget of $155 Million, played in $104 Million in the US and a total of $415 Million worldwide. 2011 surprised us positively with the movie “Soulsurfer” with a midsize production budget of $18 Million which played in over $43 Million on 2240 movie screens. Percentage wise an even greater success in the same year was the film “Courageous” which played in $34,522,221 on 1,214 screens with a production budget of only $2 Million. After 3 years with only very small releases with total gross revenues of under $4 Million per film, 2014 has surprised us within 2 months with 3 wonderful movies that all three are poised to each break their own $60 Million Gross revenue. Charting their success we can now say, that wholesome family friendly movies with overtly Christian content have broken through in 2014. The fruit of united worldwide prayer efforts is starting to show up in 2014: : “Heaven is for Real” in week 2 of its release at already $51,911,000 Gross Revenue, released on 2,705 screens with a production budget of $12 Million. “God’s Not Dead” played in $52,745,000 on 1,860 screens with a production budget of only $2 Million. “Son of God” played in $59,568,800 on 3,271 screens, production budget is N/A, Mark Burnett is the producer of this excellent film about Jesus’s life. Break through #1: The first time that 3 Christian movies have been released within 2 months at the box office and all three are greatly successful. Break through #2: The first time that 3 Christian movies with a budget of $12 Million or less will reach gross box office revenues of over $60 Million each. Break through #3: The first time that 3 Christian movies have wide releases and are playing on an average of 2600 screens. The success of these three films gives us joy and the confidence that future investments in other faith based productions will also result in good successes at the box office. The prayer efforts are of course continuing. Next prayer meeting for Hollywood Transformation is on May 2nd at 8:00 PM at a church in Hollywood. For exact information where to meet please inquire with me. Ask Wolfgang!